When England's Field Music, fronted by brothers David and Peter Brewis, released their debut album in 2005, they were known as a precise, quirky pop unit with influences ranging from Steely Dan to XTC. At times it seemed they were striving for something beyond their means, resulting in impressive failures. Their successes, on nuggets such as "It's Not the Only Way to Feel Happy," made the whole record encouraging -- this was a band to keep an eye on. However, Field Music dissolved after only one further group effort, 2007's Tones of Town, leading to "solo" 2008 efforts by both brothers: David Brewis released Sea From Shore, under the moniker School of Language, while Peter recorded under the banner of The Week That Was. Meanwhile, the band's third member, keyboardist Andrew Moore, attended culinary school. Now the Brewis brothers have reunited as Field Music (minus Moore), releasing a cohesive, tight, rocking 20-song album, Field Music (Measure). The Brewis brothers approach their new release with a seasoned execution, one with more confidence and patience. And even though this delivery carries a precision, with songs containing numerous parts, there is looseness and enthusiasm, where the earlier recordings held constraints. "I don't want to write songs imagining how the three of us are going to play [them]," David Brewis commented in a 2009 Stereogum interview. "I want to write whatever I need to write right now." The result is evident; the instrumentation, playing and singing are dynamic and immediate. Aside from string accompaniment, all parts are performed by the Brewis brothers. With David and Peter also handling production, Field Music (Measure) sounds, perhaps deceptively, like a true band effort. The influences are still there, a mix of ’70s and ’80s rock, including Yes, Todd Rundgren and Be Bop Deluxe, along with contemporary bands such as Arcade Fire, Pinback and especially Dirty Projectors. The songs are varied, ranging from the breezy, acoustic 12-string-led "Them That Do Nothing" to the intricate power pop of "Effortlessly." This confluence is perfected in "The Rest is Noise," which is oddly reminiscent of the layered theatrics of Queen and the nervous punk of Wire. While using live drums in place of machines and samples, Field Music subverts how rhythm is normally used: non-traditional instruments, including the strings and guitars (and lead guitar lines), hold the beat, not the drums. There is also an old school attention paid towards sequencing the 20 songs. 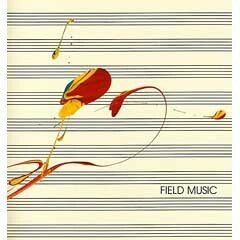 Field Music (Measure) contains arcs -- it is meant to be listened to as a whole, from start to finish. And there is no filler. By forgoing any expectations, it seems that Field Music, as a band, has comfortably found its identity. Field Music (Measure) joins the growing number of this year's excellent releases by musicians who truly believe in the antiquated art of the record.